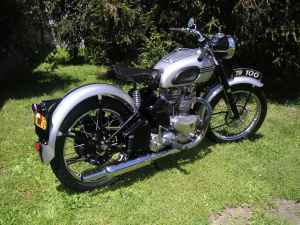 We here at Classic Sports Bikes for Sale don’t like Triumph any more then Norton, BSA, or Velocette. It’s just that they made so many bikes, and many of them are great sports bikes. 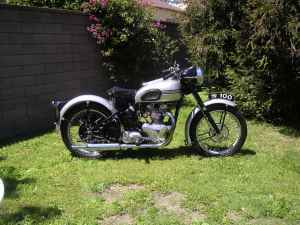 One of these early performance bikes for Triumph is the T100 Tiger and this one offered in Los Angeles is a beautiful example. 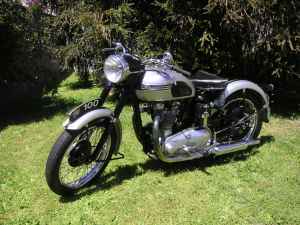 Triumph’s lead designer was Edward Turner and he had developed the Speed Twin for Triumph in 1937. He improved this design in 1939 and created the T100 Tiger. This bike was offered until war stopped civilian production in 1940. Starting back up for 1946, the pre-unit engine for the Tiger was offered until 1959, when the engine and transition becoming one unit for 1960. 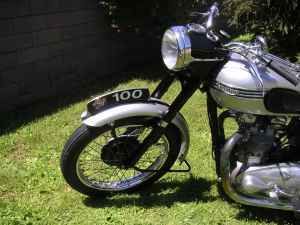 This 1951 T100 would come from the factory with 500cc, but by 1954 the Tiger would grow and became the T110 with 650cc. Making and offer when the price of $23000 is listed in the title leaves me to believe that there is going to be some wiggle room in the price. Some other changes that Turner made to the T100 from the Speed Twin was to raise the Compression Ration from 7.2:1 to 8.0:1. This may not seem like a huge difference, but the quality of gas available was one of the limiting factors for creating a true sport bike. With the 1951 Tiger, telescope front suspension was available, but you can see from the pictures this bike still had a ridged rear end. Suspension for the back was not offered for another 3 years. You will have to pay that much more attention to the road surface if you want to protect your back while riding. Previous story Yamaha RZ500 with California Title!